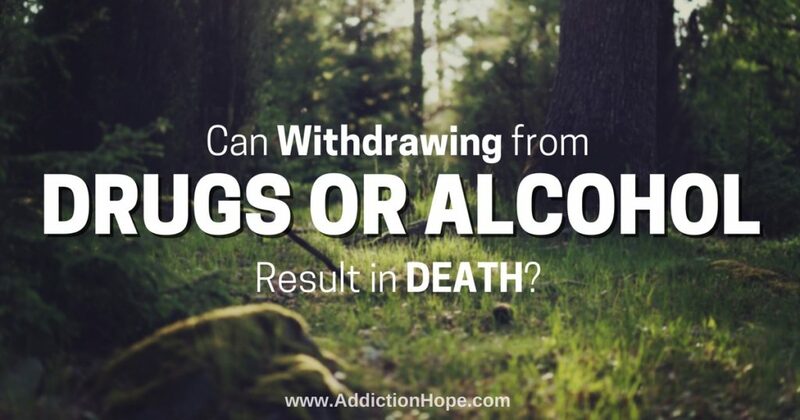 Die From Drug Withdrawal: Is It Possible This Could Happen? This entry was posted in Recovery & Support, Substance Abuse and tagged Drug Detox, Managing Symptoms, Professional Help, Signs and Symptoms on August 17, 2016 by Team Addiction Hope. Withdrawal can be a terrible thing for someone who is dependent on drugs or alcohol. People must weather some serious physical and mental reactions when they are detoxifying their bodies from hard substances. Ending substance dependency is obviously crucial. However, the process can be dangerous without medical supervision. While that is truer for some drugs than it is for others, you shouldn’t take the pain associated with withdrawals lightly. Withdrawal is your body’s reaction to changing chemistry. When you continue using a substance for an extended time, your body becomes accustomed to that chemical. This can cause drastic changes in organs, particularly the brain and heart. Certain behaviors and conditions, such as anxiety, for example, can be repressed while taking drugs – both prescription and illegal. Without the drugs, unrepressed anxiety – and similar feelings – become even stronger during withdrawal than they were before the substance use began. There are specific challenges presented with each kind of withdrawal and detox. Some substances are harder to withdraw from than others are, caused in part by the half-life of drugs. Half-life is the time it takes for a drug in one’s bloodstream to be cut in half, in reference to the original dose. The shorter the half-life time, the greater the risk for withdrawal, since the substance is leaving the body more quickly. Interestingly, opioid withdrawals do not present an altered mental state, as in the case of most other drugs. Depending on the specific opioid that was used, withdrawal symptoms will peak between 36 and 96 hours and last from seven to 14 or more days. If a patient can provide doctors with an accurate time and size of their last dose, it helps predict how long detox will take. Though the withdrawal itself may not be deadly, there can be serious mental anxiety during this process. Such anxiety makes detox extremely difficult. Those who fail to get clean often overdose soon after, as their body is no longer accustomed to the amount of the opioid they previously took. Again, though painful, withdrawal from stimulants such as cocaine or amphetamines is not typically life threatening. Instead, sufferers may find themselves severely depressed. Dysphoria is highly common, as well as the need for excessive sleep. Patients may show slowed thought patterns and physical movements, although vital functions generally remain unchanged. With this type of withdrawal, most sufferers sleep very deeply and for long periods. The recovery is gradual, and mood and anxiety levels tend to correct themselves after the first week, although they could take up to two weeks. Depression is a serious side effect of stimulant withdrawal, making self-harm an issue for those detoxing. Again, though the withdrawal may not be a danger, the aftermath can be. There are different levels of alcohol withdrawal, and they are dependent on how much and how long the individual had been drinking. Mild and moderate withdrawals from alcohol tend to occur within 36 hours from the stopping point. Intense anxiety, insomnia, nausea and shaking are related symptoms. Severe withdrawal happens after the 48-hour mark. The patient’s senses will be wildly altered, and they often suffer from disorientation or hallucinations. These can be perceived as reality, and result in extreme fear or erratic behavior. Physical symptoms such as shaking and elevated heart rates are much stronger in this type of case. A portion of people also experience seizures related to withdrawal. In short, alcohol withdrawal can be deadly. Benzodiazepines and barbiturates are highly addictive drugs because of the relaxed sensations they provide to users. Unfortunately, when the drug use stops, these substances cause very strong withdrawal symptoms. Many of the mental and physical manifestations resemble alcohol withdrawal. As with alcohol, benzodiazepine or barbiturate withdrawal without medical supervision can be dangerous. Withdrawal from benzos seriously affects autonomic functions, as well as brain function and physical movements. Patients under the supervision of a medical expert have the lowest risks, particularly because doctors will transfer them to a drug with a longer half-life for a more gradual recovery. Attempting to come off any addictive substance is dangerous, and even frightening. With medical attention and guidance, however, it can be much easier and safer to transition away from dependence. If you or someone you know is suffering from drug dependency, seek help or encourage them to do so. Sometimes, having someone who is offering support can provide the best motivation for an addict to take appropriate measures for healing. If you’ve already helped someone else or steered yourself in the right direction, you know that it can be very liberating to step away from dependency – and it can save lives. Share your experiences with us. What was it like to see or help someone going through drug or alcohol withdrawal?